“It’s a gift, not a trade.” Or it wasn’t a sly trade anymore, anyway. I couldn’t handle his haunted look, as if I’d just given him everything and he wasn’t allowed to keep it. Description: Quill, an emotionally immature but well-intentioned technomancer, crash-lands his spaceship on a remote planet and has to figure out how to repair his ship in order to leave. There he meets Hunter, an amnesiac cyborg, whose trust (or cooperation) he has to earn in order to get off the planet and to not lose his best shot at a new life. Impression: My lasting impression of this story was simply, “that was fine.” Not great or amazing, but a pleasantly short and enjoyable read. 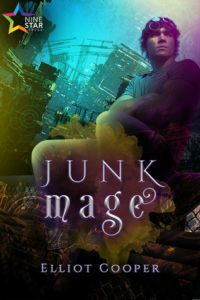 The characters were endearing, the prose and pacing were sharp, and I appreciated the glimpses of intriguing world-building that we were offered. The characters were the highlight for me: Quill’s arc was definitely not new (impulsive, immature guy who tries to manipulate his way out of situations and gets in trouble when he can’t keep things in his pants learns what it feels like to actually be nice to and help other people) but, like. It’s a good one? And it was well done here. Hunter ran a little flatter for me personally, but I was still rooting for him, and wanted them both to succeed. However, there were a few issues that impacted my enjoyment: I felt that the writing could have used a bit of a tighter edit, particularly in the beginning, both in word/phrasing choice and flow, and in some of the content that left my suspension of disbelief a little shaky. The worldbuilding just scratched the surface of some of the ideas—a situation where originality and the brevity of a short story felt like it lessened the enjoyment of the work. Most significantly, the villain/antagonist was unfortunately very one-dimensional—the kind of character that exists to serve the story, but who borders on evil just for the sake of it. Overall, for what it is, I wouldn’t have any hesitations about suggesting this to anybody with a particular fondness for cyborgs and personhood arcs.